Cook the rice according to the instructions on the package. 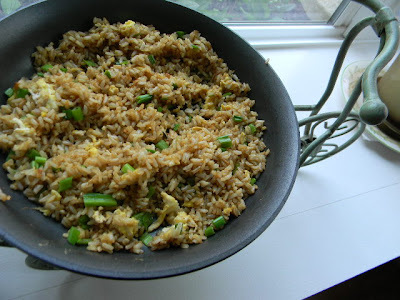 Do this ahead of time, or use leftover Chinese take-out rice if you prefer! Add some Sciabica's Manzanillo Variety Fall Harvest Extra Virgin Olive Oil to the water, though! It makes every dish better. Swirl some Sciabica's Manzanillo Variety Fall Harvest Extra Virgin Olive Oil, about a tablespoon, in a large saute pan, and add the cooked rice. Stir-fry until it is good and hot and sizzling and a little crispy on the edges, if you like that like I do! Add soy sauce to taste and color, I used about 4 teaspoons here. Create a "circle" in the middle of the rice, and pour in the whisked egg. Stir and work the egg into the rice as it cooks. Add a handful of chopped green onions or anything you want after that (cooked meats or veggies) and heat through. I put this pan of rice on a bicycle planter to take a picture because the pan was hot, and then I liked it, so there you go! Serve with anything, but especially 3 Cups Chicken, our family's new favorite meal!